When we engage with the writings of Shakespeare and his contemporaries, we encounter a culture radically unfamiliar to us at the start of the twenty-first century. The past is a foreign country, and so too are many of its texts. This readable and provocative book seeks to enhance our understanding of early modern literature by recovering the contexts in which it was originally produced and consumed. Taking us back to the courts, theatres and marketplaces of early modern England, Jason Scott-Warren reveals the varied ways in which literary texts dovetailed with everyday experience, unlocking the distinctive social practices, economic structures and modes of behaviour that gave them meaning. He shows how the periods most beguiling writings were conditioned by long-forgotten notions of knowledge, nationhood, sexuality and personal identity. Bringing an anthropologists eye to his materials, he offers richly detailed new readings of works from within and beyond the canon, covering a span that stretches from Erasmus and More to Milton and Behn. Resisting any notion of the period as merely transitional a staging post on the road leading from the medieval to the modern world Scott-Warren reveals the distinctiveness of its literary culture, and equips the reader for fresh encounters with its extraordinary textual legacy. Any undergraduate student of the period will find it an essential guide, while scholars will find its fresh approach invigorating. Jason Scott-Warren is University Lecturer in English, University of Cambridge. List of Maps and Illustrations. 1. Technologies of the Word. 3. Print in the Marketplace. "A compelling, highly readable historicist survey that sets out to restore a productive sense of strangeness to sixteenth and seventeenth-century texts"
"Of immense value for all students of early-modern literature...a genuinely helpful and informative guide." "One of the pleasures of this book, throughout, is Scott-Warren's thoughtful alignment of historical research and commentary with precise and often enormously insightful close readings of literary works." "A stimulating guide to this period of literature for both students and more advanced readers." 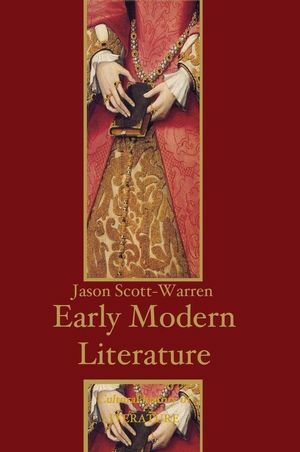 "The strength of Jason Scott-Warren's sensitive and subtle Early Modern English Literature is that he can be blunt and dogmatic. Most of all, he basically sees the past for what it was, another country, blissfully unaware of us and ours, alien and self-enclosed." "If you read one critical work this year, make it: Jason Scott-Warren, Early Modern English Literature." "Surveys and samplings of periods have a tendency to sacrifice subtlety for sweep, and clarity for coverage. When the period in question is arguably the richest in literary history then theres a real risk of summary and synthesis becoming superficial. Fortunately, Jason Scott-Warren's superb overview is as precise as it is panoramic. Clinically executed close readings of texts coupled with painstakingly elaborated cultural contexts make this a must-read volume for students and scholars alike." Provides comprehensive background material on the contexts in which early modern literary texts were produced and consumed. Unlocks the distinctive social practices, economic structures and modes of behaviour that give texts of the period their meaning. Offers richly contextualized readings of works within and beyond the canon, covering a span that stretches from Erasmus and More to Milton and Behn, covering all the key authors studied by undergraduates in between. Written with great clarity and directness, and makes a lot of quite difficult recent theoretical thinking about the early modern period seem approachable for inexperienced students.